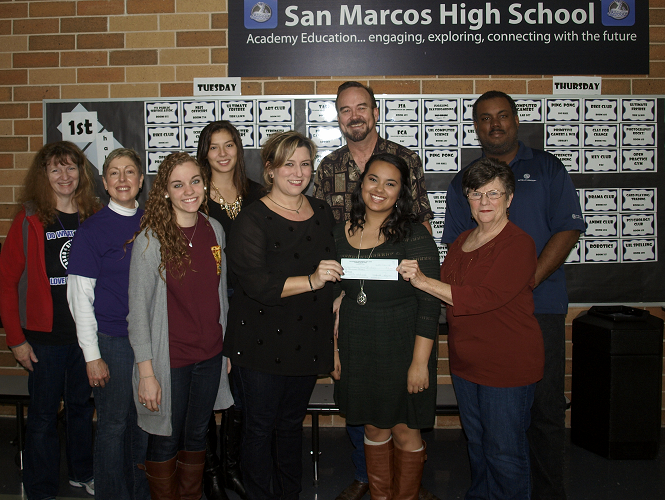 Members of the San Marcos Performing Arts Association (SMPAA) Board of Directors present SMHS Choir Director Dawn Sheridan-Reinhuber, students and faculty with a $2,000 donation to help financially strapped young singers afford private voice lessons. Tax-deductible contributions towards this on-going effort may be made through SMPAA or the SMHS Choir Boosters. 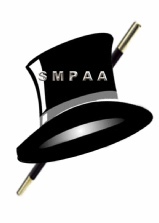 For more information please visit smpaa.com or SMPAA’s FaceBook page. Photo from left to right: Jeanne Davis-(SMHS Booster Officer), Michelle Darling-(SMHS Principal), Konnor Callender-(SMHS Choir Vice-President), Monet Moreau-(SMHS Choir PR officer), Dawn Sheridan-Reinhuber-(SMHS Choir Director), Rick Bowen-(SMPAA President), Mercedes Gonzalez-(SMHS Choir President), Wanda Runyon-(SMPAA Treasurer), and Antonio Edward-(SMPAA Media Coordinator).